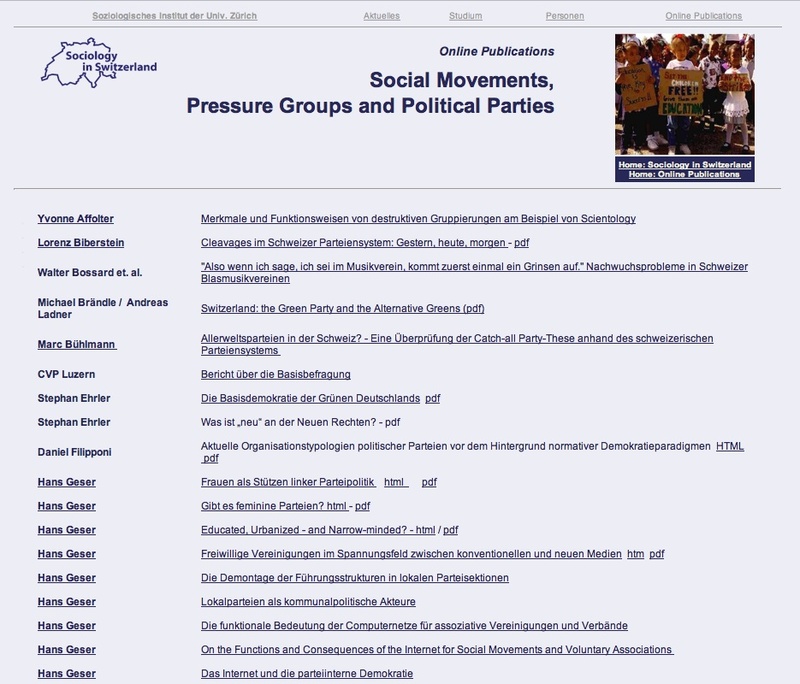 Compiled by members of the Soziologisches Institut of the Universität Zürich and part of the larger resource “Sociology in Switzerland”, the Social Movements, Pressure Groups and Political Parties website is essentially a wide collection of online journals, texts and external links. Focusing on the study of social organizations, this website covers a wide range of areas and subjects from environmentalism to political extremism and voluntary associations. It provides long lists of articles, publications and various full texts on voluntary associations as well as connections to external web-resources and journals. A simple content organization and a few annotations are offered for each item, available in English and/or German. Users can access most material free of charge but some related journals require a subscription, yet offering abstracts at no payment. Although records can be downloaded in their original format, generally in pdf, no advanced search feature is available. While new material is posted regularly, only some basic navigational mapping is provided and the general outline is simple but effective.